Will the highly rewarded political sycophants whose purposeful actions mislead the uneducated and politically faithful who follow their lead ever be held accountable for the lives and property lost from lack of preparation for climate change. Unfortunately hundreds of people died last night in a horrific storm that foreshadows the increasing frequency and severity of weather events likely to occur as climate change intensifies. 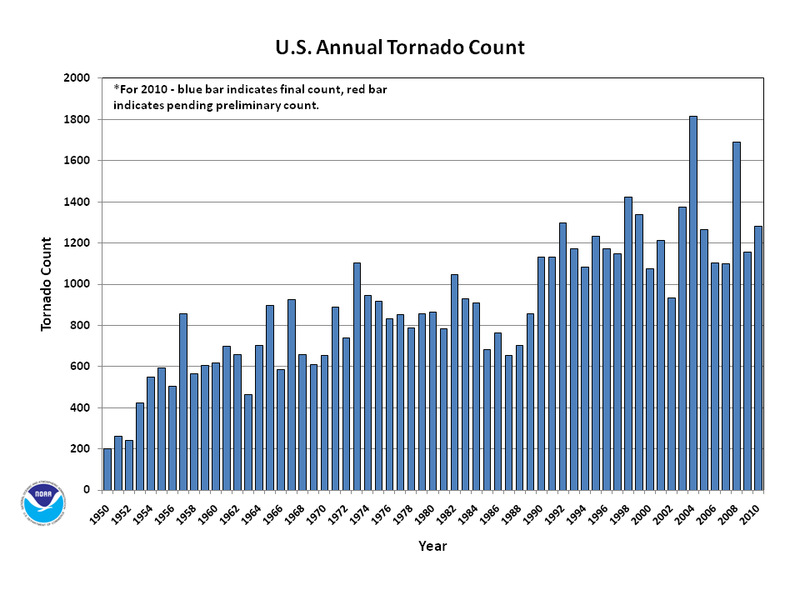 Let's look at the frequency of tornadoes over time. Even though individual years may vary up or down in numbers, the overall trend is for an increasing number of tornadoes. That is how statistics works. Statistics isn't about individual elements of a process, it is about the overall process. The following official chart based on scientific data clearly shows an increasing trajectory. NOAA National Climatic Data Center, State of the Climate: Tornadoes for Annual 2010, published online December 2010, retrieved on April 28, 2011 from http://lwf.ncdc.noaa.gov/sotc/tornadoes/2010/13. We are living through, so far, the first individually discernible new weather phenomena in quite some time. There have been years without summers. Humans were impacted by Ice Ages, but as far as I know no records were created documenting it. This is the first time we as a species have known that climate is changing and there is a possibility that we could mitigate the change to some degree. We are not doing so because of superstitious suspicion of science and political manipulation for economic gain. The cost of promoting ignorance in our citizenry is loss of life, livelihood, and perhaps, our planet as we know it. That unpredictable social impact will result from climate change, shifts, and extremes is evident in food shortages and political unrest. Weather cannot be tamed nor can it be predicted with complete certainty, but it is something for which you can prepare. Here are some starting points for weather preparedness. At one level it dosen't really matter what caused the increasing intensity of weather phenomena. It is with us and we are going to have to deal with it. One of the best sources I've found for updates on what is happening and what are current thoughts on the topic is Daily Climate. No the title isn't oxymoronic. Arizona Progressives are real and easily found. Um, the co-chair of the House Progressive Caucus is from Arizona in case you haven't noticed; and the Baja Arizona secessionist movement is real. I recently reconnected with Lefty Blogs and am amazed at the linkage and coverage it gives me of Arizona from a perspective you will find NO WHERE ELSE. If you want to find out what is happening in Arizona, period, you need to use this feed. As an Arizonan I am so tired of having the same one or two derogatory and grossly inaccurate major media stories be all I hear about what is going on in my state. I honestly do not have time to search all the blog feeds for real Arizona news when our wacko legislature and leaders get us into the news so often. Use Lefty Blogs to peruse the hot local issues. You can always get to it from the link in the right (sorry) column. You will have to ignore a couple of posters who from my estimation seem to be on the bash Arizona bandwagon, a perspective that anyone who loves Arizona should not have, but I will let you make your own determination on that front. Check it out. If you want to know what the rest of Arizona (thinks beyond the Arpaio, Brewer, Pearce psychobabble) this feed is essential. I'm stepping off the soapbox now. Platitudes aside, if you are at all interested in the budget of the United States of America you owe it to yourself to at least compare the 3 options on the table. In spite of the warm and fuzzy comments emanating from many of the progressive media sources yesterday, President Obama's budget talk is not a budget and lacks details, so there are really only Ryan's plan that decimates our government and way of life, the Democrat's plan that is getting little airplay, and the Progressive Democrats plan that has gotten no attention from national media. The deficit reduction committee isn't a budget as such but selectively looks at programs with an eye to one end only - deficit reduction. Reuters ignores the Progressives Budget entirely in its Fact Box. Ryan's proposal for the Republicans gets all the air play so you probably are familiar with it. The Democrats' proposal isn't getting too much attention specifically, and the Progressives are getting none. Too many supposed reporters and journalists are commenting that once again we will start with concessions from Obama and move toward the Republican points through "compromise." This is a farcical negotiation. Look at Ryan's proposal and look at the Progressive Democrats' proposal and then end up left of Obama's -- that is what should be happening. So do yourself a favor, as should our legislature, and use the info from Jeffrey Sachs' overview of the PDA budget (starting at 1:25 seconds into the video) as a starting point in negotiations and not Obama's which is where negotiations should end up, not from which to begin. I am a bit of a cynic when it comes to Arizona justice or any justice in any state that prides itself on stupidity, but living in such states seems to be my lot in life. Indiana and Arizona have both had more than is any one state's right to stupid judicial actions. Indiana rounded off pi in in a House Committee, but fortunately did not allow it to become law. Both states kill people for killing people though they both are "Christian" run states that I'm sure subscribe to the Ten Commandments including the one that goes, "Thou shall not kill." I grew up in Indiana and remember getting in my first politically charged "discussion" on a school bus in November 1964 the morning after Johnson won the election over Goldwater. I had to be all of 7 years old, but I remember it clearly. The oldest sister, who had to be all of 9 or 10 years old, of a family on my bus route looked as though a family member had died when I brought up the election. I later came to understand that the parents in the family were ultra conservative and attended The Church of the Nazarene in the town that was the county seat just south of the township grade school we attended. I was never a 9 year old in Arizona. I've only lived here for a few decades. 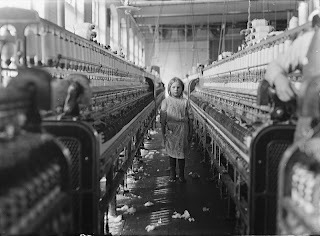 I am however the mother of a native Arizonan, and she was a nine year old here, once upon a time. I was a Girl Scout Leader to a group of 9 year old girls. I was a Sunday School Teacher to a class with 9 year old girls in it. The faces of these girls I have known and in several cases come to love are the ones who flash before me when I also pull up the class photo mental image of Brisenia Flores. I still cry every time I think of her asking Shawna Forde, Jason Eugene Bush, and Albert Robert Gaxiola why they shot her parents and of her then begging for her own life. Things like this are not supposed to happen to 9 year old girls. Tucson knows all too well that 9 year-olds can die from the heinous actions of deranged people. But the facts of this case push even this understanding beyond what a saddened Tucson can believe. This falls into the same league as sexual predators who torture and kill children. This falls into the category of pure evil. How could we as a community have allowed such vile predators to reside in and do such harm to our community? I will never understand this. I know people were talking about connections between Minutemen militias and the extremely violent right wing rhetoric that routinely, at least weekly from my understanding, came to our streets in the last 10 years. Recruiters were connected to drug traffickers. Police refused to come to respond to calls for assistance when there were assaults at demonstrations. Individuals burned flags and tried to bait surrounding crowds into violence. The weaving of fringe groups into the daily life of our community must have numbed our outrage when groups of people from outside of our community descended upon our area to create a police state mentality in our backyards. Why did and do we tolerate people who have no business here who supposedly guard a border from people who are for the most part guilty only of not looking like them. Could we have done more? Of course we could have. The portent of violence was there. Suspected serial killers and mentally unstable individuals were allowed to play soldier with real guns where I live and where so many of the nine year old girls I have loved, lived. I'm not sure that killing individuals who are disturbed enough to carry out such atrocities is any better than what the accused and convicted did. But I am in the minority, supposedly, just as I was when I expressed concern years ago about the influx of militia types into our county. So two of the three people on trial for the murders of Bresenia Flores and her young papa, Raul Flores, have been convicted of murder and sentenced to die by lethal injection. One trial remains. Killing these people will not ease my conscience of the persistent doubt that perhaps there was more that we could have done, that I should have tried to do more to wake people up to what was and is happening at the edges of our community. The deaths from our ignorance seem destined to climb and include Shawna Forde, Jason Eugene Bush and probably Albert Robert Gaxiola, also accused in the murders, who goes on trial June 1st. I'm sure I will write more then. The last thing I ever said in person to one of my brothers before he died was that I would fight for healthcare for the regular folks. I need to do more. I'm weary, struggles that never end can wear one down, though. Today would have been the birthday of another brother who also died far too early from preventable causes. Today is also the day the federal government shuts down most likely because a bastion of wimps and neocons have taken supposedly taken direction from an astroturf "movement" to reduce the size of government and sever all federal funding from social programs whose support touches the lives of almost everyone in the U.S. I owe a great deal to Planned Parenthood. I used their services to get yearly checkups and birth control prescriptions and devices in my teens and throughout my twenties. Without them I would probably have had an accidental pregnancy with a man I lived with and who I tried to leave several times before I successfully was able to do so. I was stalked by this guy when I left. Public domain image from Wikipedia Commons. My life would have been ruined if I had gotten pregnant by that man I lived with for 10 years. I wanted to get away from him after only a few months of being with him, but without a family support system I didn't see any way to do that without becoming homeless. I believed him when he told me I had no other options. So I stayed in school, took out loans to complete college and went to planned parenthood for my healthcare needs and to get help making sure I wouldn't bring an unwanted child into the world. I was lucky. I didn't get pregnant. Now a bunch of selfish bullies, nearly all white and male, on Capitol Hill are trying to strong arm legislation through as a rider on a funding bill that would defund Planned Parenthood, the very organization that helped me to be able to get away from an abusive long term relationship because there was not a child connecting me to him. I doubt I would have ever been able to get away from him if I had had a child. This whole tea party, fundamentalist, militia mentality connects to what I hope are the death throes of a group of dis-empowered patriarchal a**holes. These guys believed from early on that they had a right to rule over their families, their communities, and their nation because white guys had always ruled here. Now that change is happening, although at a far slower rate than one called for by demographics, these guys are doing everything they possibly can to regain what little power they can hold onto for a short while, even if it means the death of thousands of and the destruction of tens or hundreds of thousands more lives. Such utter disregard for their brother and sister citizens shows that this has nothing to do with finance, Christianity, or governance and everything to do with entitlements - the entitlements that small minded and probably small body-parted white (or orange) men feel are being denied to them. I hope these are the last throes of segregationist, racist, misogynist America. Right now it is women being attacked but the elderly, our children, our ill and infirm are next up on the tea party gallows. This next year will be hell as these little men stomp their feet, and lash out wildly trying to hurt anything and everything they can as they manipulate, steal, coerce and destroy government of, for and by the people. 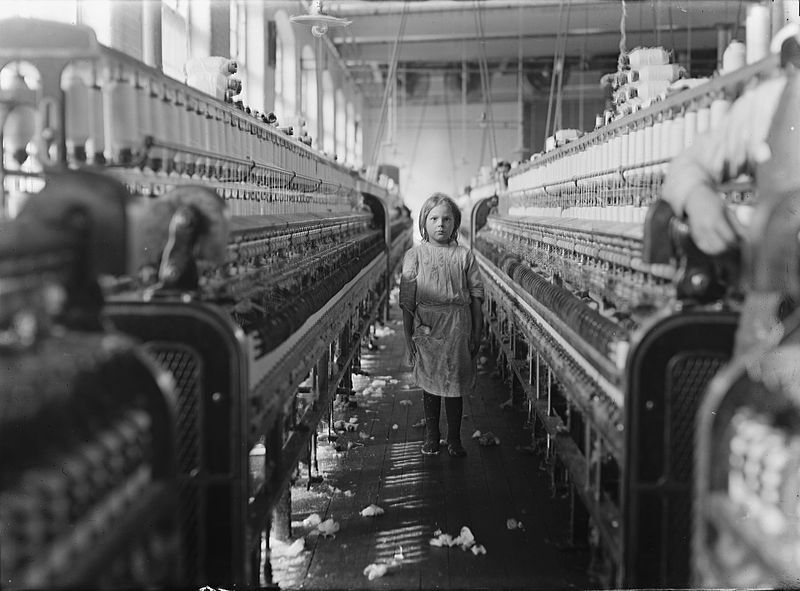 1908 Child Laborer in North Carolina. Wikipedia Commons. I for one will not let them do this to us. I believe there are enough like me out there to stop them.